Antiques expert Jonty Hearnden reveals his favourite holiday destinations. “Plenty has been said about Majorca recently, but my wife and I go to a part of the island we feel is definitely worth talking about. “For the last three years, we’ve gone on holiday there. But while everyone else turns left out of the airport, we go to the right. “The airport feels as big as Stansted and just as modern. It’s quite extraordinary to think it’s effectively there just for tourists. “We hire a car and drive to the south east coast, where there are some beautiful towns. Even better, these places aren’t riddled with Brits. Only once have we heard another English voice in the area. “We visit towns like Llucmajor, Porreres, Campos and Sineu. The beaches in Sa Rapita are stunning, as is the beach at Playa Es Trenc. It stretches for miles. 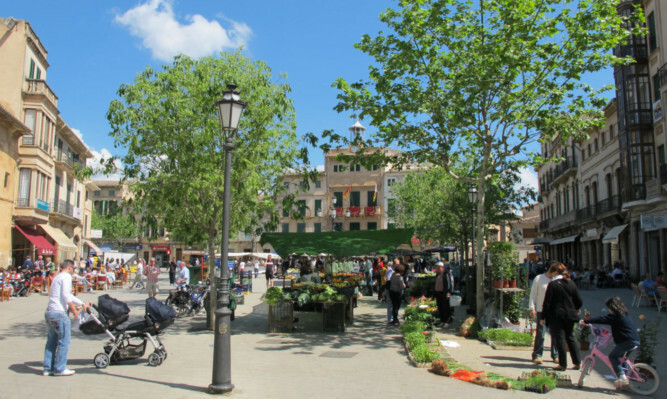 “One of the great things about Majorca is it’s easy to get to and relatively cheap once you’re there. We usually stay in farmhouse hotels. The rooms are fairly basic but the cuisine is of a high standard. “There hasn’t really been any inflation on the pricing over there in the past three years. The room costs 80 euros a night and a main course meal will be 1015 euros. “There are lots of markets too. We bought lots of clothes and shoes, especially my wife, when we were in Sineu recently. Every garment was only 20 euros. But I resisted visiting a brocante market I spotted, since it wasn’t a busman’s holiday. “We like to drive around and explore, but ultimately our idea of a good holiday is the beach, markets and eating well. We always try the local cuisine. “Growing up, I didn’t go on many foreign holidays. The first was when we went to Portugal when I was 11. Our usual family trip was to the east coast of Essex in our caravan. “When I was made redundant after first joining the auction rooms, I was offered a chance to travel. I was given a ticket for New Zealand and the flight left the next day, but it turned into an 18month trip. “After New Zealand I went to Australia, south east Asia, China, Nepal and I travelled through Europe on my way home. It was life-altering. “Luckily, when I came home I soon got a job with Bonham’s. I’ve been back to Asia several times, but I’m always envious when I hear of people visiting places like Vietnam, which I couldn’t visit when I was travelling due to them being communist countries. Jonty Hearnden is an antiques expert and TV presenter, best known for Cash in the Attic. The 53-year-old is one of the stars of the show that’s loved by millions of viewers around the world. Now Cash in the Attic has its own website, providing the public with expert valuations of collectable items and antiques in categories such as ceramics, stamps, furniture and even retro clothing. By uploading a video or photo of your item to cashintheattic.com, a trusted expert will value the item and you will be emailed a valuation certificate, usually within 48 hours, all for a small fee.